The camshaft opens and closes the engine’s intake and exhaust valves at the right time. This is achieved via an exact stroke and a precisely defined sequence. The camshaft is driven by the crankshaft via gears and timing belts. With a transmission ratio of 2:1, the camshaft rotates only half as fast as the crankshaft. The precise shape of the cams is crucial for ensuring the correct opening time and valve lift. The steel used in their production is characterised by high wear resistance. 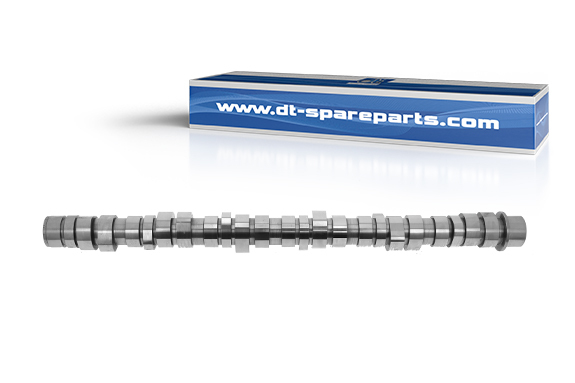 Induction hardening of the camshaft prevents micro-cracks in its surface and increases its service life. Its quality is additionally ensured by 3D recordings and dynamic tests. If the camshaft is replaced, the bearings must also be replaced and the attached components checked. They must also be checked for proper functioning after a camshaft adjustment. It is also essential to check the oil supply to the lubrication points. During the subsequent assembly, the correct valve play, the correct assembly torques, as well as the tightening sequence and alignment with the crankshaft must be adhered to (as per the vehicle manufacturer’s instructions) in order to prevent incorrect loading and thus early failure of the camshaft. The camshaft may also need to be adjusted according to the respective vehicle type. For all assembly work, the tool/special tool specified by the vehicle manufacturer must be used.